If you’re familiar with Fijian rugby, you’ll know that the Pacific Island nation’s alternate shirt has traditionally been a rather fetching light blue colour. It doesn’t take Sherlock Holmes to work out that this shirt is most certainly not that. 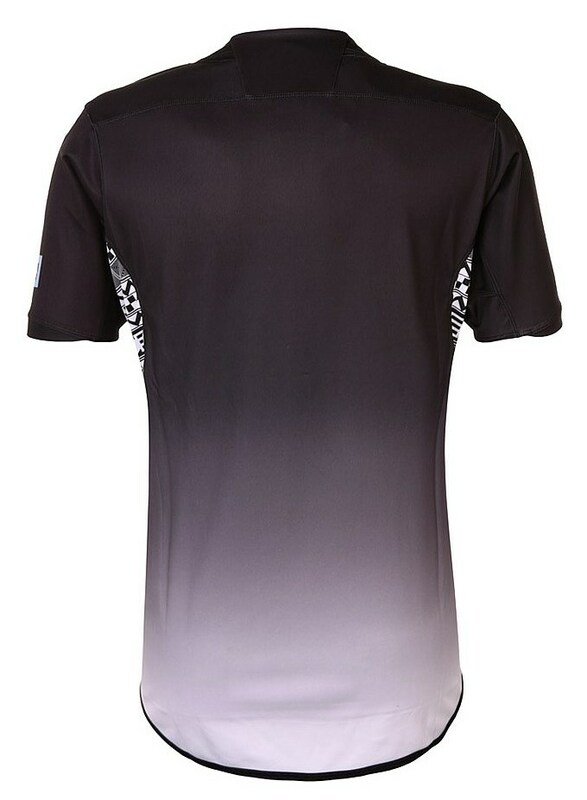 Indeed, continuing a prevailing trend of monochrome alternate shirts we’ve seen from pretty much everyone in this World Cup, the alternate shirt breaks from tradition by being predominantly black, with a rather eye-catching white-to-black fade. Indeed, this is actually the first alternate shirt we’ve seen this World Cup that hasn’t been white, so it’s actually quite nice to have a bit of variety, even if there is still a fair bit of white on here! 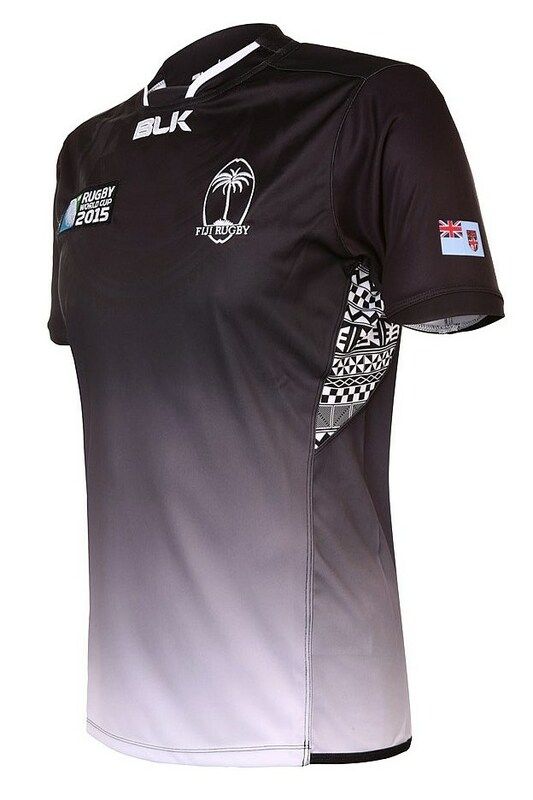 While ditching the blue will probably disappoint some, the black isn’t entirely without precedent – Fiji’s hugely successful Sevens team have been wearing black as an alternate shirt for a few years now, and if the thinking behind it is to encourage Fiji to bring some of the Sevens magic to the 15s arena, we’re not going to complain. The colour aside, things are pretty much the same as the home shirt here – a little disappointing given how much effort BLK clearly put into making the Romania and USA alternate shirts starkly different from the home. That said, as with the Samoa alternate shirt, the use of colour allows the design to emphasise things in a slightly different way. The black definitely makes the ‘tapa’ motif on the sides of the shirt pop out a little more than it does on the home shirt, and feels more of a focal point to the design, whereas the black makes the striking civavonovono breastplate pattern on the chest area is a little less prominent, probably because the colour fade draws your eyes away from the top of the jersey.